The workplace can be a hotbed of difficulty and incivility—from rumors spread about an individual, to the agonies of stress, to physical attacks and even death. Evidence suggests that not only does incivility have significant implications for employees, organizations and society, it is also on the rise. In recent years we have experienced increased acts of incivility in the workplace, social media and government positions. There is a direct correlation between uncivil behavior and financial outcomes for organizations. It is estimated that stress related to uncivil actions in the workplace costs organizations approximately $300 billion annually. The cost of personal implications for employees is often too high to calculate as individuals experience loss of reputation and significant psychological and physical distress. With the increased use of social media, individuals are experiencing incivility that crosses the boundary between their personal and professional lives. 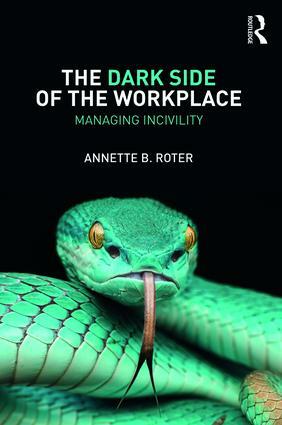 This book delves into the darker side of the workplace, discussing bullying, toxic work environments, corporate psychopaths, the struggles of stress, and more. It combines recent research and case studies to provide an understanding of these behaviors, and offers practical solutions on how to cultivate a healthy working environment.